Oh, my, Peach Melt-In-Your-Mouth Cookies are spectacular. 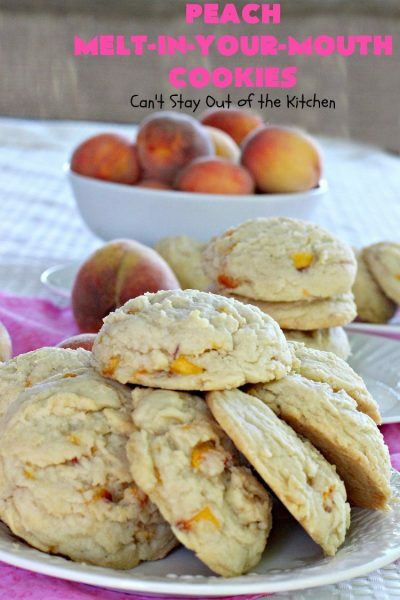 I have to admit these were one of my favorite peach goodies that I made last month in an effort to use up all of our fresh peaches. These cookies do seem to dissolve in your mouth. I think that’s because they are made with oil as well as butter and have sugar and powdered sugar and cream of tartar in the ingredients. That combination is simply breathtaking. These cookies are soft and beyond delicious. 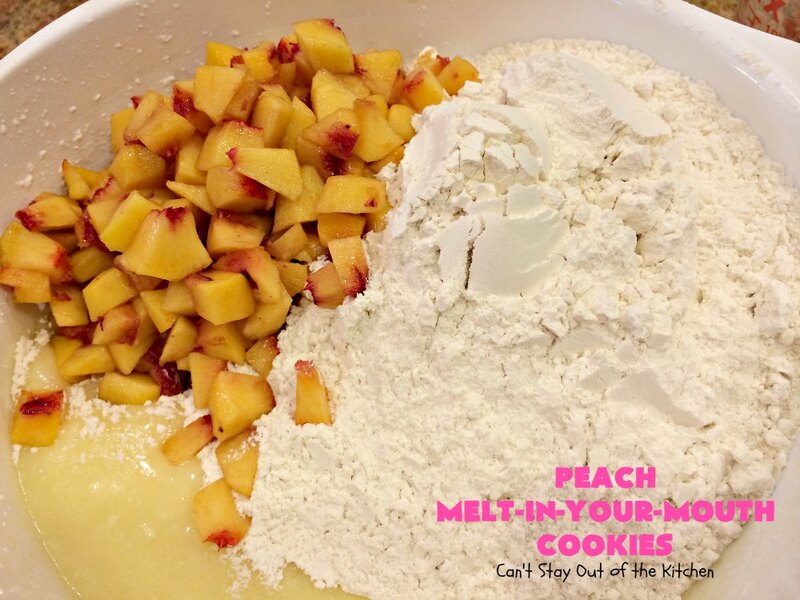 I love peaches and having peaches in desserts is one of my favorite things. 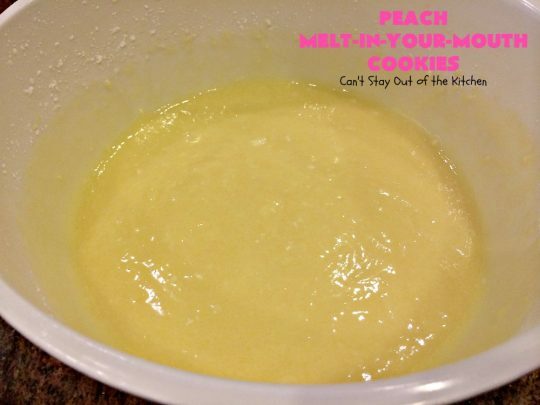 Usually I have to settle for apples because they are available year round, but since we have our own peach trees now, it’s nice to be able to expand my repertoire of peach desserts with many new options. When I was hunting through recipes last month looking for ideas on desserts to make, I stumbled across my friend, Mimi’s, Melt-In-Your-Mouth Cookies. It’s a great recipe and one I’ve used before as a base for a cookie I wanted to add other ingredients too. 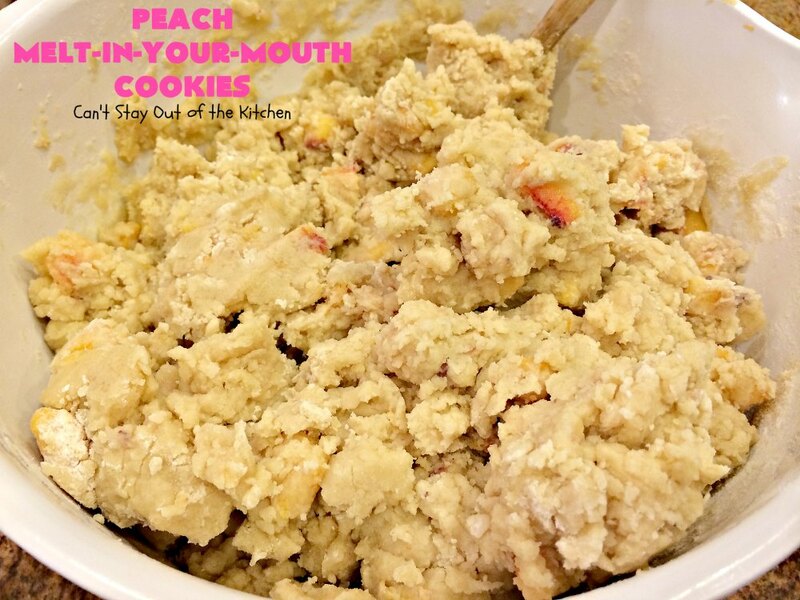 I decided to give the recipe a whirl with peaches. I’m so glad I did because it turned out beyond my wildest expectations. 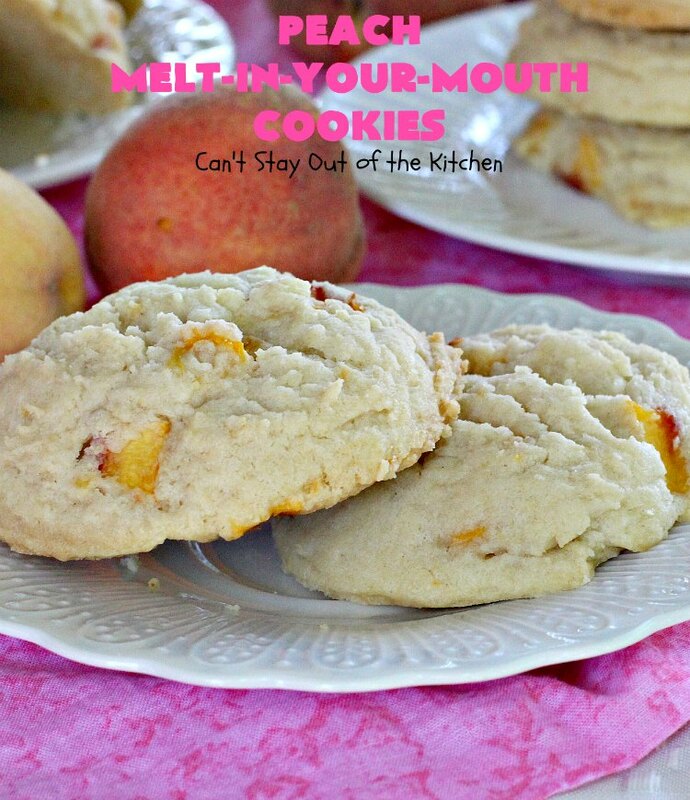 Peach Melt-In-Your-Mouth Cookies are delectable. 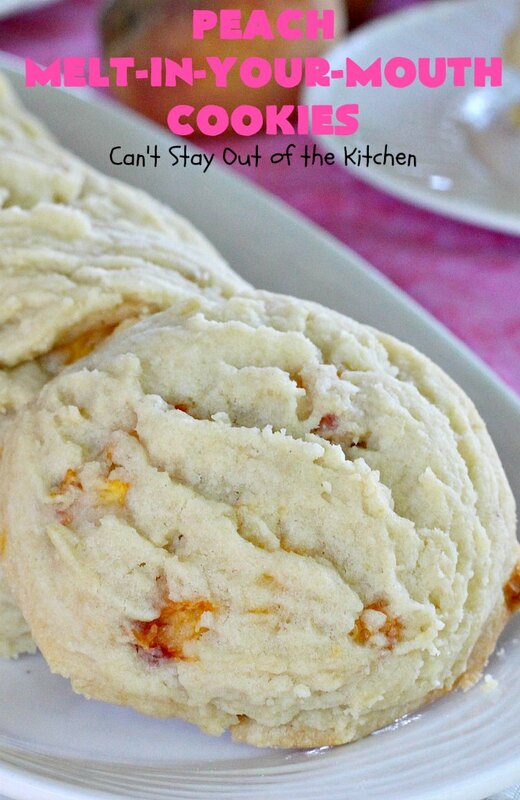 It was so hard not to gobble all of these cookies up immediately! Fortunately (or unfortunately), sanity returned and I boxed them up for friends. 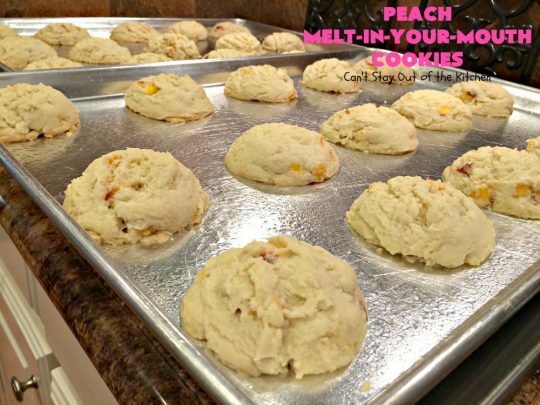 If you’re looking for an outrageous cookie your whole family will enjoy, I think you’ve found it in Peach Melt-In-Your-Mouth Cookies. These cookies are great for any party, summer or fall brunch or shower, afternoon snacks or family gatherings. But you’d better hurry. Peaches won’t be in season too much longer. Make up a batch of these sensational cookies while you still can. 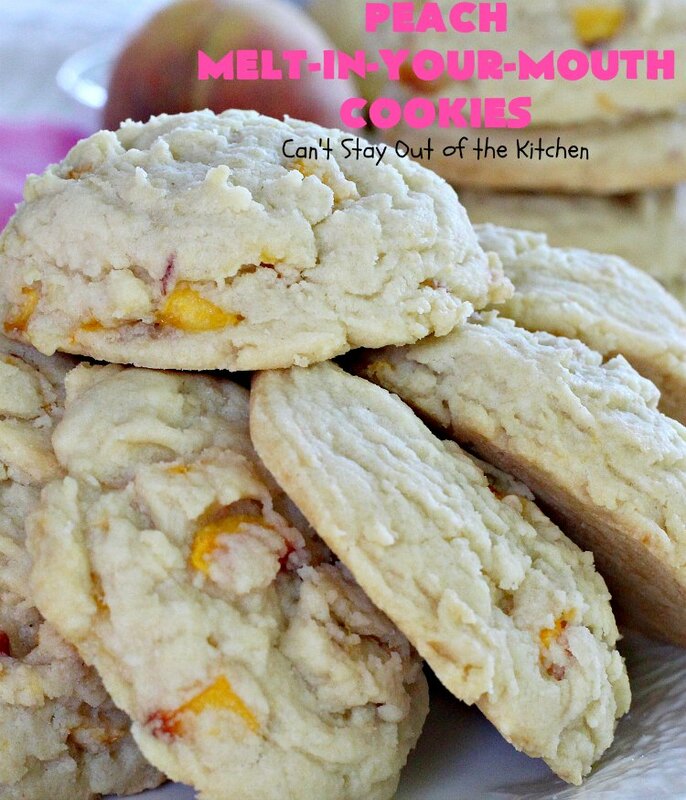 Peach Melt-In-Your-Mouth Cookies are spectacular. Each bite of these fantastic cookies just seems to dissolve in your mouth! Peach Melt-In-Your-Mouth Cookies are great to take along for summer and fall picnics. 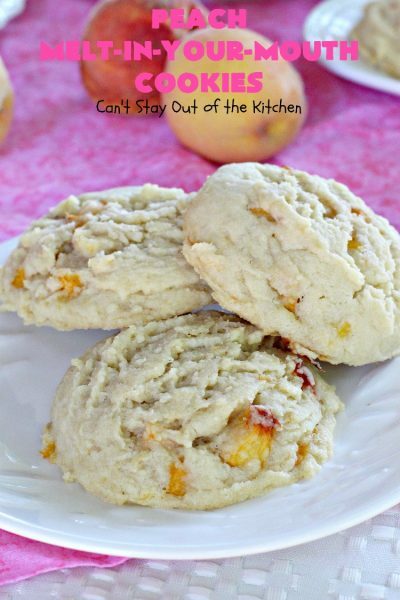 This is a terrific way to use up fresh peaches. Place sugar, powdered sugar, softened butter, eggs, salt, cream of tartar, baking powder and vanilla in a mixing bowl. I made a double batch so the pictures show more than for a single recipe. Add UNBLEACHED all-purpose flour. Bleached flour toughens baked goods. Add finely diced peaches. Stir ingredients with a wooden spoon. Spray cookie sheets with cooking spray. 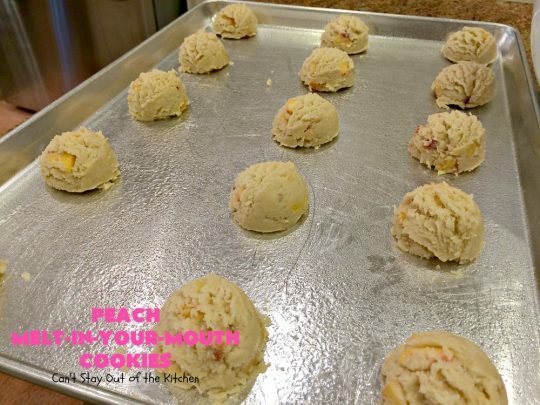 With a one-quarter cup ice cream scoop, scoop dough and place on prepared cookie sheets. Bake at 350 for 18-20 minutes or until done. These cookies were whoppers. 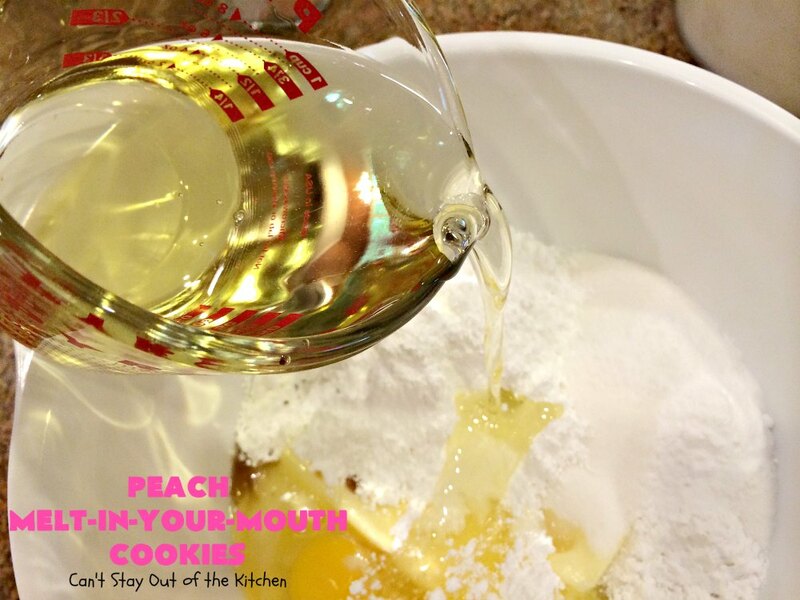 Smaller cookies will take less baking time. I highly recommend using fresh peaches if you can get them. 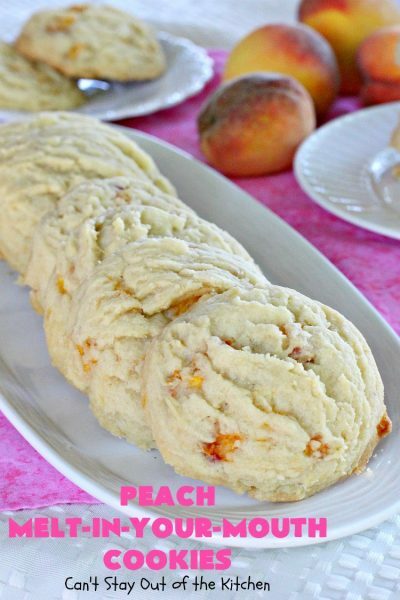 If you have to resort to frozen or canned peaches, dice them and pat them really dry with paper towels before adding to the batter. Otherwise, too much excess moisture will cause the cookies to flatten out and loose their shape and consistency. Don’t Peach Melt-In-Your-Mouth Cookies look terrific? I loved the texture of these heavenly cookies. These magnificent cookies are to die for! The sweet, shortbread-type cookie just seems to dissolve in your mouth. 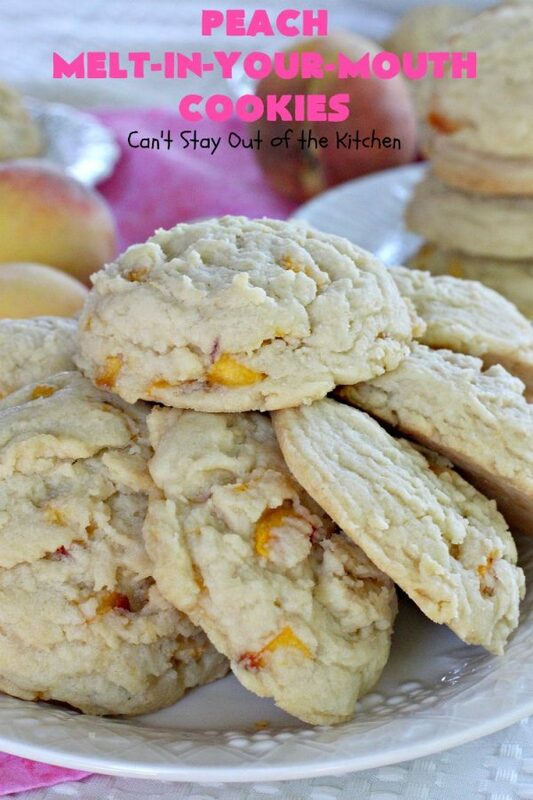 The addition of peaches make these cookies burst with flavor. 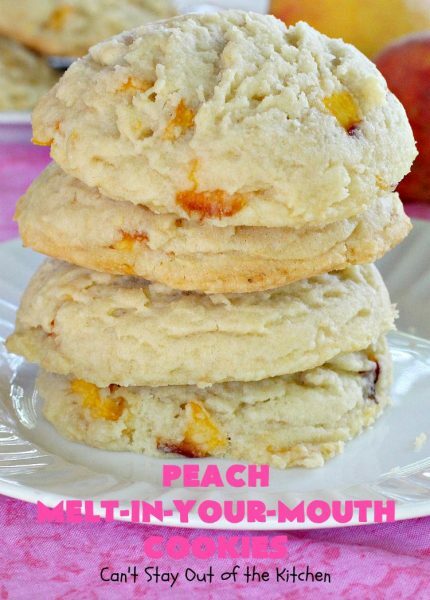 They're the perfect treat for summer holidays, potlucks and backyard barbecues when peaches are in season. In a large mixing bowl, soften butter. 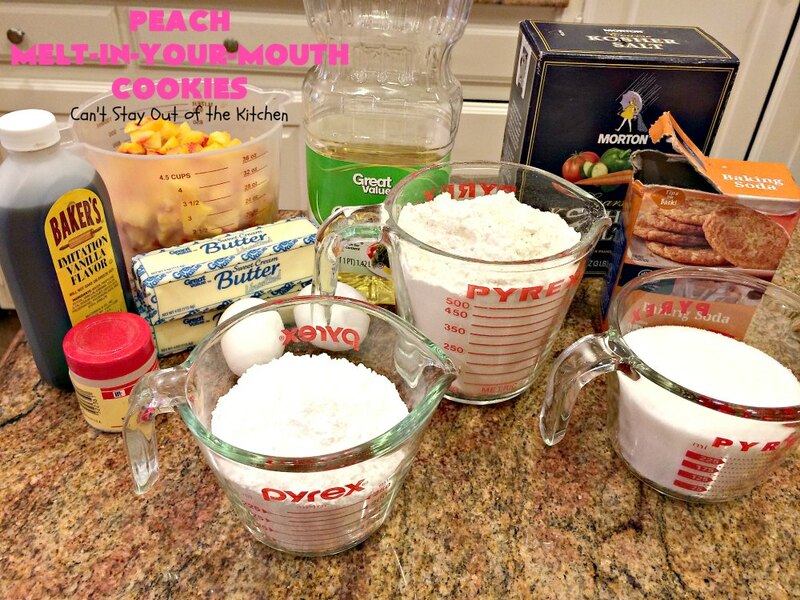 Add oil, sugars, vanilla, egg, salt, cream of tartar and baking soda. 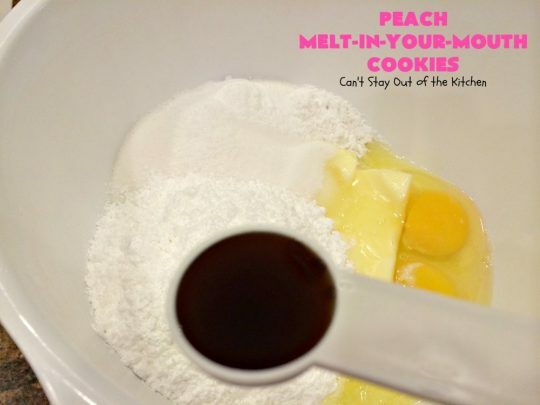 Using a ¼ cup ice cream scoop, scoop dough and place on prepared cookie sheets. Bake at 350° for 18-20 minutes or until done. NOTE: These larger cookies take longer to bake then regular sized cookies. These magnificent cookies are to die for! The sweet, shortbread-type cookie just seems to dissolve in your mouth. 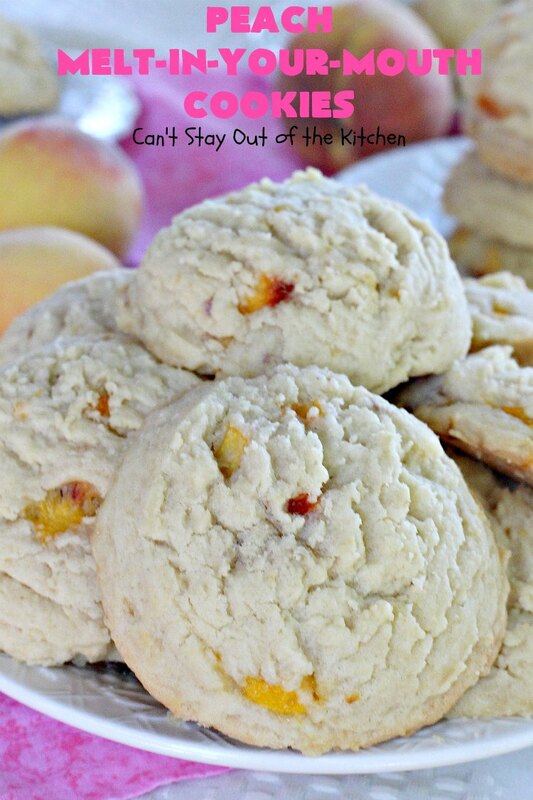 The addition of peaches make these cookies burst with flavor. These larger cookies take longer to bake then regular sized cookies. 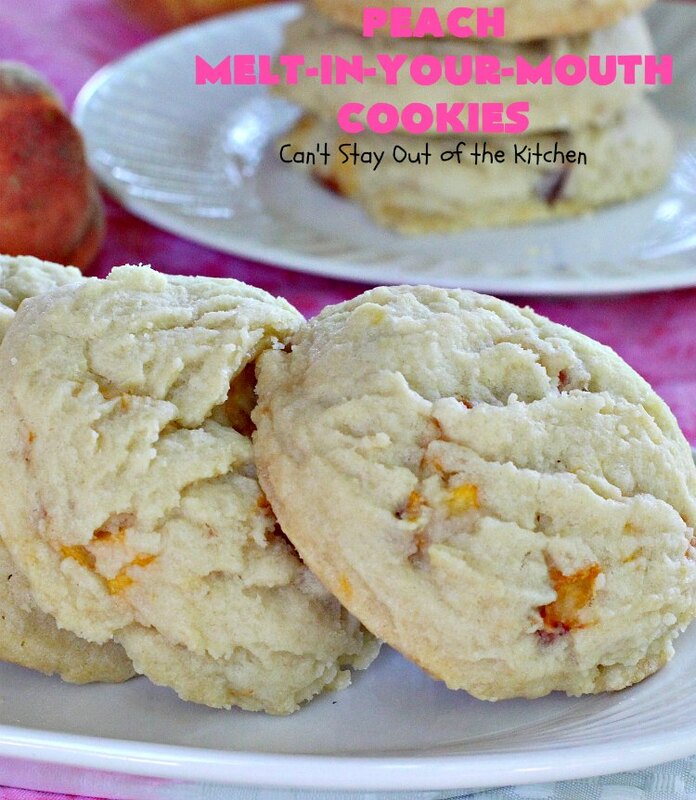 Each bite of Peach Melt-In-Your-Mouth Cookies is filled with lovely peach flavor. Words can’t express how heavenly these cookies were. Get yourself to the store and buy some peaches and make up a batch of these spectacular cookies today. You, like me, will be in awe of how wonderful they really are! If you bring these delicious jewels to any tailgating party, they’ll be cleaned out in no time! I just made these and they are fantastic !! That said, I am wondering the best way to store them ? Hi, Sara. I would store them in a seal-tight plastic container on top of your counter for up to 5 days. You can also freeze them and take them out as you need them. You can microwave them a few seconds to soften them before eating, if desired.